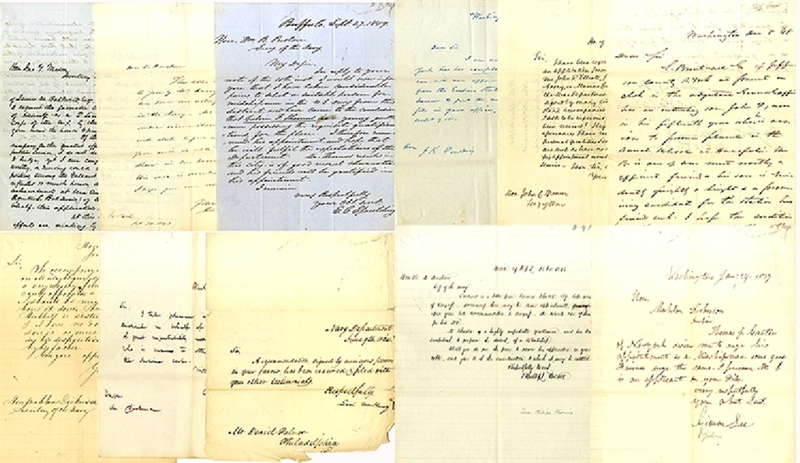 Group of (11) Autograph Letters Signed by various politicians to the Secretary of the Navy, includes: ALS, John McKeon (1808-1883), New York Representative, 1843, to Secretary Henshaw....; plus, ALS, E.G. Spaulding (1809-1897) New York Representative, 1849, to Secretary of War Preston...; plus, ALS H. Walbridge (1801-1869) New York Representative, 1848, to Secretary of War Mason...; plus, ALS Daniel Dickinson (1800-1866) New York Senator, 1848 to Secretary Mason...; plus, ALS D.D. Barnard (1797-1861) New York Representative, 1842 to Secreatry Spencer...; plus, ALS Aaron Vanderpoel (1799-1870) New York Representative, 1840, to Secretary of War Paulding...; plus, ALS by Levin Woodbury (1789-1851), as Secretary of the Navy to Daniel Palmer, 1834....; plus, ALS C.C. Cambreleng (1786-1862) New York Representative, 1837 to Secretary Dickerson...; plus, ALS R.H. Gillet, New York Representative, 1837, to Secretary Dickerson...; plus, ALS Gideon Lee (1778-1841) New York Representative, 1837, to Secretary Dickerson...; plus, ALS J.P. Phoenix, New York Representative, 1843, to Secretary Henshaw. All very good or better condition.